Teacher recieves two certificates of appreciation . Teacher recieves two certificates of appreciation Dr. Eng. 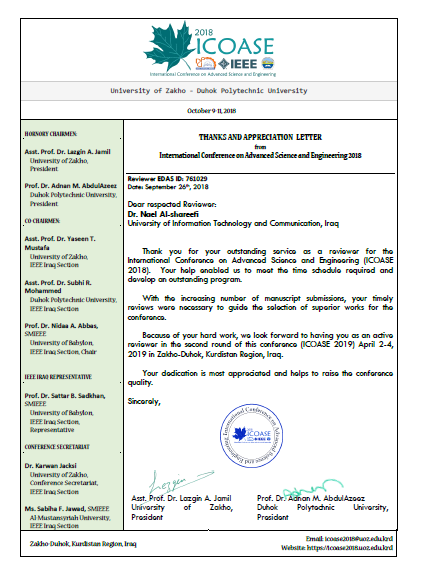 Nael Ahmed Mohammed , teacher at the Faculty of Engineering, University of Information and Communication Technology, received two certificates of appreciation for his evaluation of a number of research papers in ICOASE 2018 International Conference on Advanced Science and Engineering, held jointly by the University of Duhok and the University of Zakho for the period from 9 to 11 October 2018. He also received a degree from the International Journal of Engineering & Technology of the Science Publishing Corporation (SPC) for his evaluation of a set of research papers presented to this magazine.